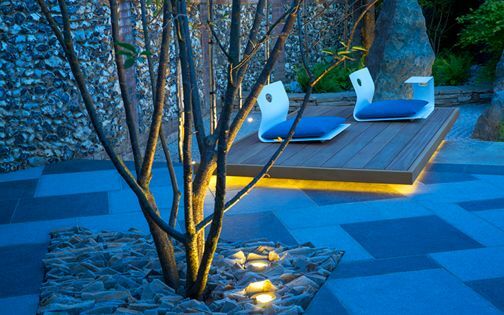 The seating hub of an outdoor space is often formed with an instinctive approach, where we aspire to personalise how we rest ourselves among the trees and shrubs. Yet, an architectural seat may not be comfortable, while an ergonomic perch isn't necessarily candy for the eye! 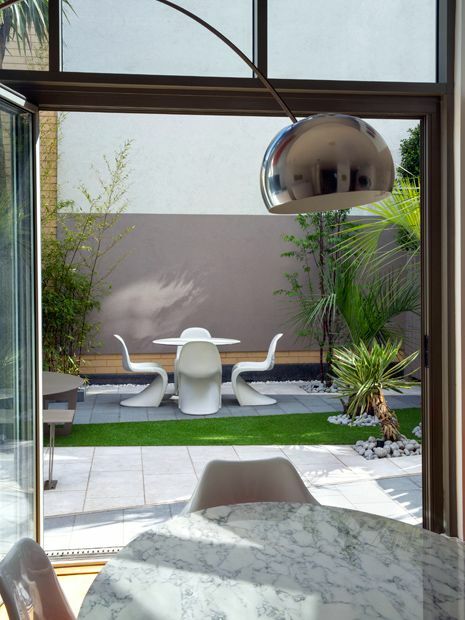 One of the primary questions we ask new clients is where they'd prefer to situate their seating zones, and follow with a detailed appraisal of the site's sun path, shade patterns, key views and privacy prospects. Many garden design blueprints take direction from seating hubs, and evolve to enhance these pivotal positions. 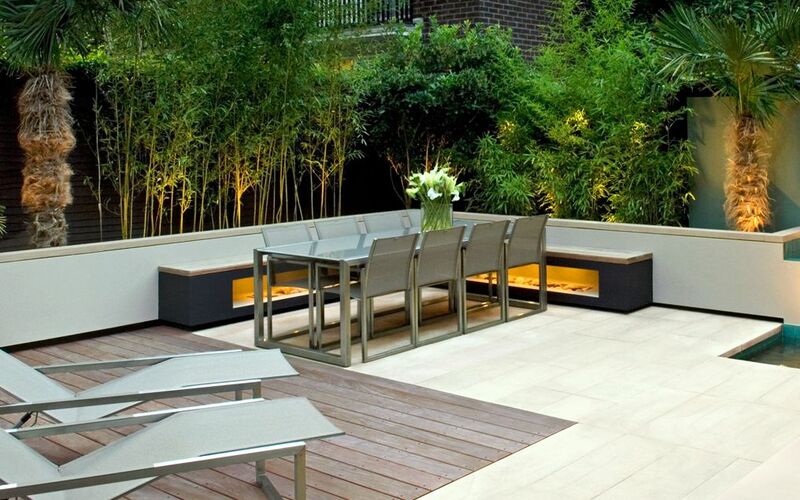 Whether formal, casual, built-in or free-standing, outdoor seating areas epitomise the contemporary garden ethos as bespoke elements – sustaining diverse merits across a broad spectrum of landscape settings. Within our urban environment, we seek the most private seating position possible, where at times, achieving precious seclusion is a tricky proposition, when there are windows everywhere, and extending the boundary's height isn't feasible. Yet, no such conundrum exists in this cinematic roof terrace, 16 floors above the Thames Barrier. 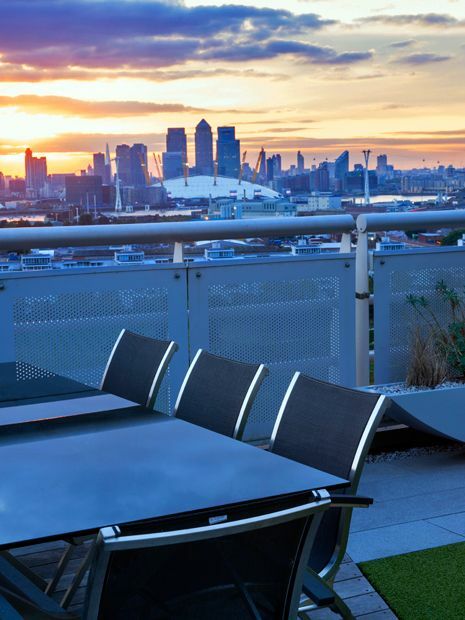 The sofas face west to soak up great sunsets and immerse in the capital's most expansive cityscape elevation, where London cable cars traverse O2's iconic silhouette in a highly entertaining, surreal perspective. We all agree the view is everything, invariably influencing where we choose to live, and inspiring our favourite holiday destinations. When designing an outdoor space, we discover panoramic potential in each unique site by combining perceptive observation to determine seating orientations. 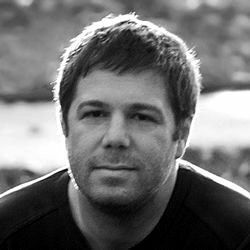 Naturally, there's an inherent polarity between the views in a small Islington garden compared to a city roof terrace, an Italian lake country garden, or a rural mountain view, where each garden is set into a distinct landscape, requiring specific focus in its seating design. The perpetual dynamic reciprocation of green and blue hues, where skylines form a kaleidoscopic backdrop for transitory foliage silhouettes, transforms outdoor ambience minute by minute. When we succeed in recreating this natural sanctuary, our seating hubs sustain continual use amid well-defined and versatile landscape designs. 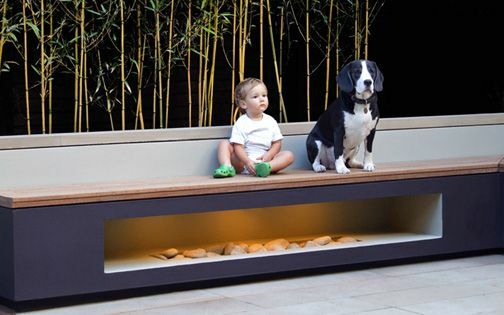 Built-in seating delineates personal, functional hubs, when benches attached to planting beds generate distinct focal points, defined by comfort and intimacy within contemporary garden design settings. Soft landscaping infuses this tactile, immersive outdoor experience with delicate textures, while timber imparts warm detail nuances. Designing a void below a bench increases legroom ergonomically, where LED lighting emits a mellow glow – articulating greater sense of space. 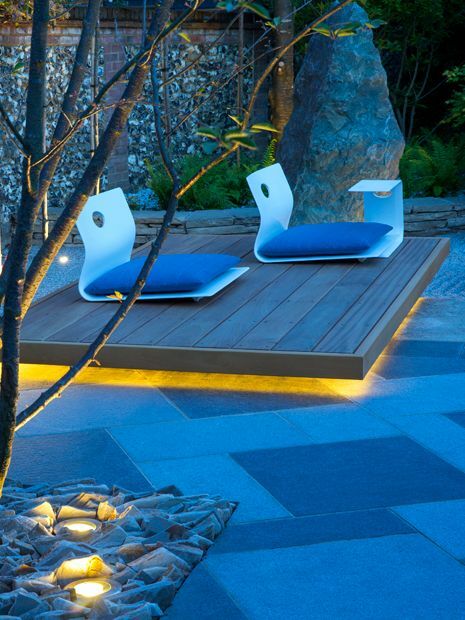 We often integrate the sitting orientation into an inspiring vista, a spot filled with sunrays or subtle water sounds, alongside soothing foliage – the essentials of pure garden design luxury. The outdoor seating in this expansive Covent Garden rooftop takes varied social forms, maximised to enhance up-close London landmark vistas. The roof garden's epic breadth spans the apartment's entire footprint, providing abundant scope for a bespoke cooking hub. 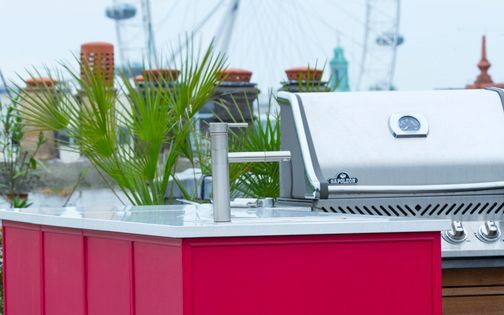 The vivid outdoor kitchen is enveloped by low, cosy sofas, while a dining table facing BT Tower forms a quiet breakfast spot, enfolded in herbs, scented Lavenders and Palm trees. 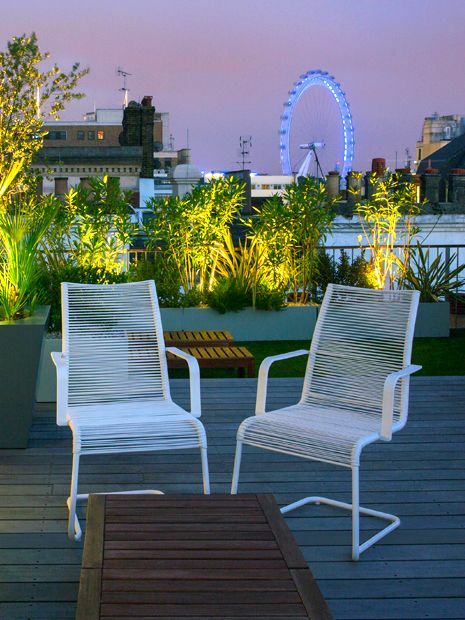 Sun loungers, arranged amid an artificial grass platform opposite the London Eye, absorb captivating city panoramas while nestled within a verdant urban sanctuary – augmented by a surround sound system. High up in Caro Point's 11th floor, gusty wind is a force of nature across its main rooftop garden terrace. Without a tall, evergreen Photinia hedge anchored into paved surfaces, the seating area will inevitably become an underused outdoor space, lacking privacy and vital refuge. The verdant shelter we created adds a touch of green above Chelsea's urban treeline, improving alfresco lounging, while preserving an expansive Wembley Stadium vista. In the proximity of an open-plan kitchen, entertaining guests forms an effortless get-together, where refreshments and surround sound are close by. 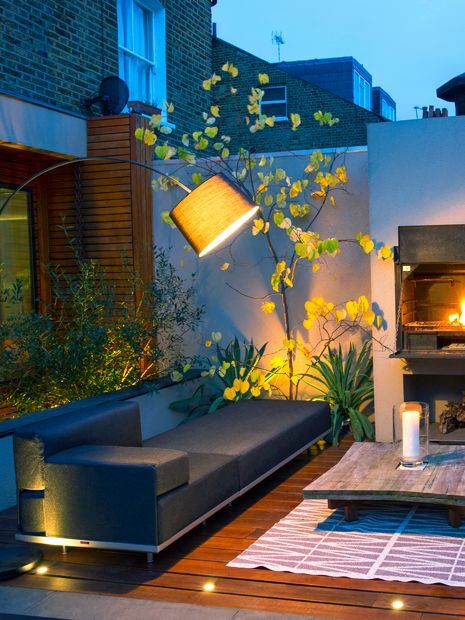 In this Clapham Town back garden, outdoor seating is elevated effortlessly all year around, and as both clients are rarely able to enjoy their exuberant outdoor space during daytime, the lighting design and built-in fireplace produce warmth and illumination to form essential garden amenities. 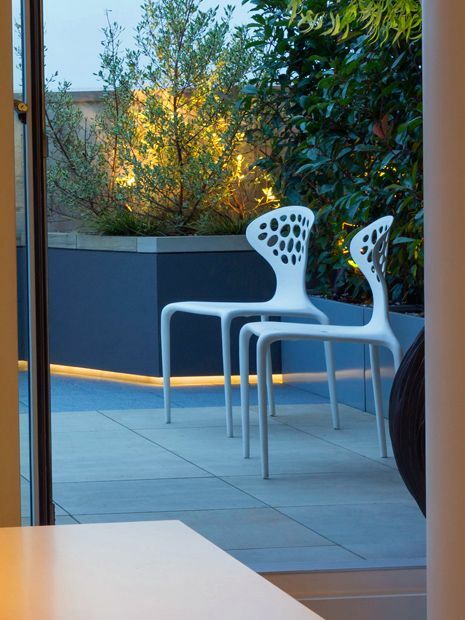 The combination of diverse light sources creates a practical dynamic, and enhances ambient lighting, where a multitude of free-standing options with integrated light and heat enables alfresco activities in all types of London weather. Planting a Mulberry tree above a seating area would be somewhat incongruous with its surroundings, where suitable flora is pivotal. Tactility, scent, sound, texture and reflection improve our sense of well-being, and humanise the space, while proportional scale forms soothing comfort and shelter, frames views and adds silhouettes and shade. 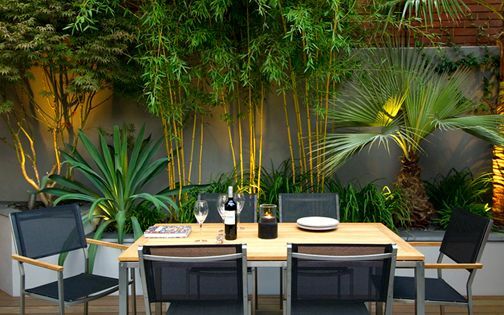 We all need invigorating green by our seating zones, although practicality is vital, and as much as we love a delicious crop, keeping these areas free from falling fruits and spiky foliage is undoubtedly handy. 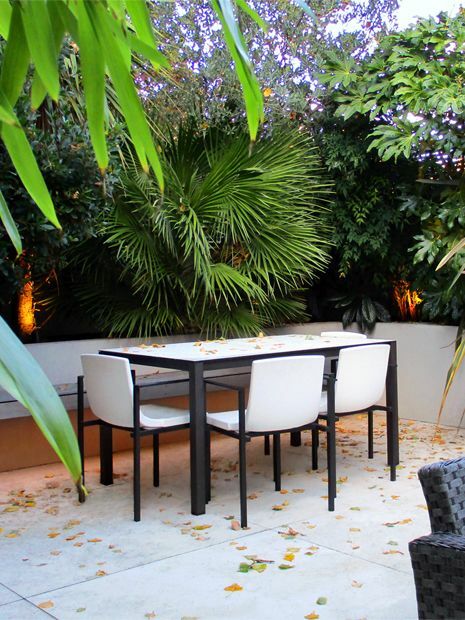 The merits of tropical garden design invariably enhance and revitalise a tranquil, architectural outdoor seating hub. 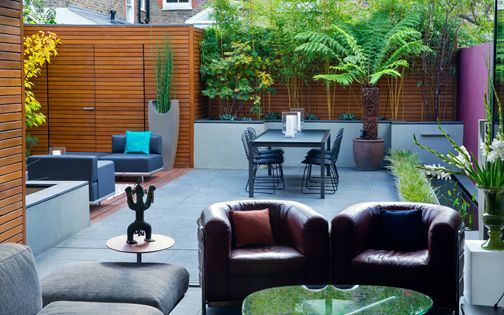 There's great originality in arranging outdoor seating inline with a home's interior, and in small urban gardens, this distinct concept produces an authentic connection – particularly when clients are furniture savvy. In this North London garden, the outdoor space is equal in size to the kitchen, where sense of depth increases via bi-folding doors which slide fully open to extend the areas into one. While an oversized dining table forms half the kitchen, the garden furniture takes modest scale, conserving precious entertainment space. The clients' Mid-century Modern furniture, selected for both areas, creates cohesive aesthetics and indoor-outdoor fluidity. 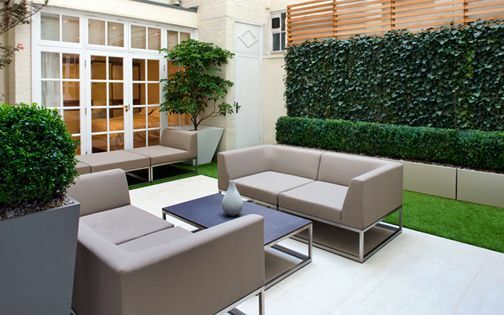 Lounging is surely the ultimate form of modern outdoor living; we're now in the most desirable place of the home, at the right time, ready to savour it. In our detail designs, we select optimal zones for such alfresco activities, frequently oriented towards soothing sunlight and shelter. 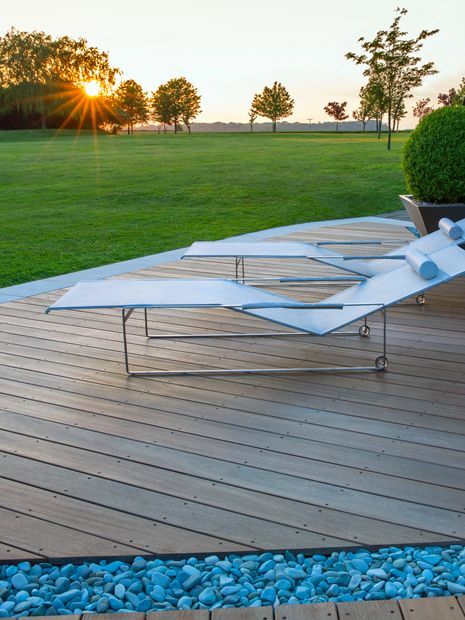 Many of our clients love their loungers, and deck designs are ideal for repositioning these seats to follow the diurnal arc. 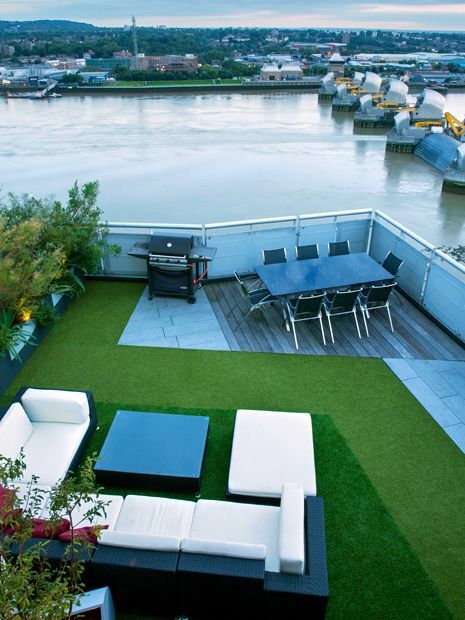 At times, we design and build sizeable floating decks or spacious daybeds to form a contemporary lounge. This outdoor social milieu sustains an upbeat, multifunctional seating zone, where the whole family enjoys informal gatherings entertaining guests – it's a whole lotta seat, for a whole lotta breathing space! We all seek precious privacy around our seating areas, where the main design goals are defined by detailing tangible screening, while articulating a greater sense of seclusion. 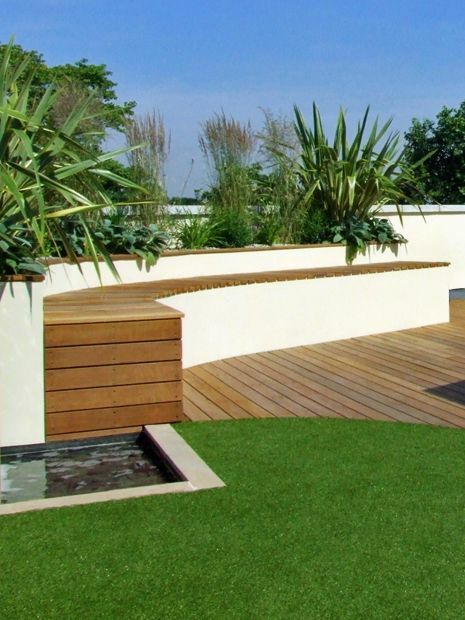 In countless London urban gardens, boundary construction is height limited and can often cast heavy shade, where we achieve viable alternatives by utilising tall foliage plants. When feasible, we'll screen near the seating zone, as sight lines are foreshortened at this ergonomic height, augmented with screening close to the garden's perimeter. We produce integral congruity when linking seating hubs into privacy screens, creating contemporary outdoor space seclusion, while enhancing cosiness, durability, liveability and permanence. Every ledge we perch on, a set of steps we sprawl across, or an old tree log we rest upon, form ergonomic seating hubs. 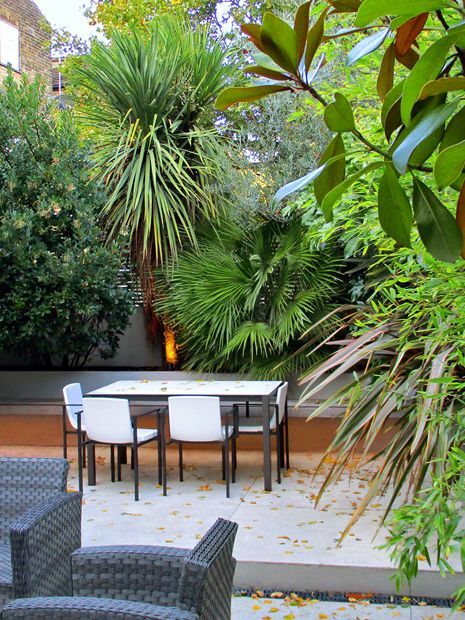 A contemporary garden ought to include these planned and ad hoc breathing spaces to define a connective, individualised setting within an architectural layout. 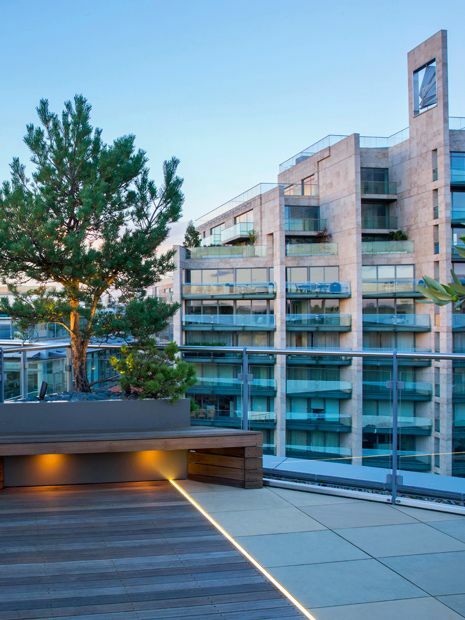 When designing a London urban roof terrace, its views narrate the pinnacle of the seating experience, where river sunsets, amid the dazzling heights of metropolitan architecture, present the backdrop for great seating zones – our bespoke and rather intimate city hubs.